In computer networking , an IP address ( internet protocol address ) is a unique number that devices use in order to identify and communicate with each other on a network utilizing the Internet Protocol standard. (Sometimes this is shortened to just "IP" as in "My IP is A.B.C.D".) Any participating device including routers , computers , time-servers, printers, internet fax machines, and some telephones must have its own globally unique communicable address. IP is a network layer protocol in the internet protocol suite and is an upper layer protocol that also provides globally unique addresses (e.g., MAC address for ethernet ) but two of these addresses will not necessarily be able to communicate to each other. IP adds a service on top of these data link layer protocols through the use of an IP address that provides the ability to uniquely identify with and communicate with any other device on the network. 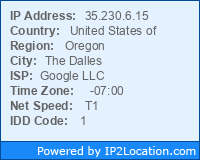 In other words, an IP address is like a full address for postal mail while a MAC address is just the house number. For example, there are many addresses with a house number of 898 but there is only one address for 898 5th Ave, New York, NY United States . Simply mailing something to "898" will not get it there but "898 5th Ave, New York, NY, United States" is a globally unique address. The unique nature of IP addresses makes it possible in many situations to track which computer and by extension, which person has sent a message or engaged in some other activity on the Internet. This information has been used by law enforcement authorities to identify criminal suspects; however, dynamically-assigned IP addresses can make this difficult. Since IP addresses are not easy to remember, the Domain Name System provides the ability to map domain names (e.g. www.wikipedia.org ) to an IP address ( 50.97.68.122 ). A hostname is a label that is assigned to a device connected to a computer network and that is used to identify the device in various forms of electronic communication such as the World Wide Web, e-mail or Usenet. Hostnames may be simple names consisting of a single word or phrase, or they may have appended a domain name, which is a name in a Domain Name System (DNS), separated from the host specific label by a period (dot). In the latter form, the hostname is also called a domain name. If the domain name is completely specified including a top-level domain of the Internet, then the hostname is said to be a fully qualified domain name (FQDN). Hostnames that include DNS domains are often stored in the Domain Name System together with the IP addresses of the host they represent for the purpose of mapping the hostname to an address, or the reverse process.